The fourth webinar in the 2016/2017 TERMIS PAP series was given by Ms MacKenna Roberts, a legal consultant at Life Sciences IP, UK. Intellectual property (IP) is a fundamental part of business that has to be thought about from the beginning! Amongst others, it is key for securing investment, provides a competitive advantage, increases shareholder value, and can provide a source for revenue and tax incentives. Map IP onto your product pipeline and do not forget to revisit IP strategy when your business plan changes. The ownership/licensing of IP must be done in a secure way involving legal professionals! Patents: Patents Act, 1977; the European Patent Convention 1973; and the Biotechnology Directive №98/44. A patent provides the patent owner with exclusive rights for a fixed-term to make, use and sell an invention in exchange for publicly disclosing the invention. Only certain types of subject matter are patentable. Furthermore, patent protection is not invulnerable. Even following it having been granted, it can be challenged and found invalid. If your patent was found invalid, you may be financially liable! 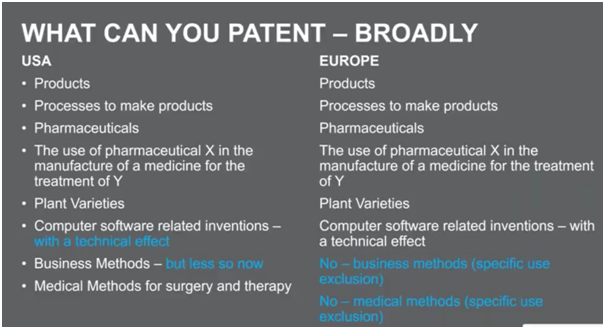 Examples of patentable IP. What can be patented depends on the jurisdiction! Patents normally run for 20 years. This can be extended up to an additional five years through a Patent Term Extension (US) or a Supplementary Protection Certificate (EU). These are intended to compensate for delays due to lengthiness of regulatory approval. Lapsed patents may be revived for 12 months in the EU and up to 2 years in the US. Be careful: if your competitor revives a lapsed patent it owns, you may end up suddenly infringing on that patent. One in three patent applications have already been patented! It is essential to correctly name the inventors on the patent. To protect your IP in 5 countries over 5 years could cost you £90,000! There are also annual/periodic renewal fees that increase with time. Therefore, it is important to budget for IP protection costs in your business plan. 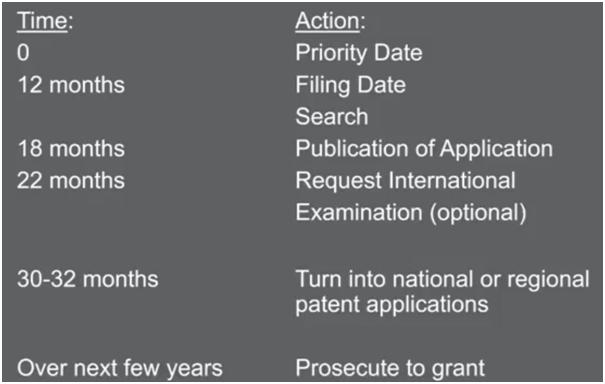 The timeline for protecting your IP through a patent. 1. Subject matter: the invention must fall into a patentable class of things. Not all inventions are patentable. Which ones are can differ by country. 2. Novel: The invention must not already be known by others/must not have been disclosed to others. Trade secrets — Valuable IP protected through confidentiality. Offers a weaker protection than patent, but has no expiration date. Know-how — A very important aspect of IP in TERM is “know-how”, a valuable piece of practical knowledge, skill or expertise. For example, a practical procedure to improve the quality of an engineered tissue construct that nobody else knows about. Know-how should be recorded in a paper trail, evidencing it. You can have a patent and confidential know-how at the same time relating to the same invention. Copyright — Copyright is an exclusive right given to print, publish, perform, etc. a certain literary, artistic or musical material for a fixed number of years. If your copyright is important for your actives as a company, make sure you are aware who owns it: Unless there is an agreement to the contrary, copyright is owned by the person who created the work! Patentability depends on what “prior art” has been invented/disclosed as to whether your invention is novel and non-obvious. Public disclosure of your invention by anyone anywhere in the world will irrevocably destroy your invention’s patentability. Be careful with publications, conference talks, etc. as these may damage/destroy the patentability of your IP. Are there any therapies/devices/invention out there similar to mine? If so, can those patent holders prevent my use, manufacture or sale of my TERM therapeutic? Jurisdiction matters! For example, if your competitor has patented the invention in Europe, you may be able to manufacture and sell your TERM therapeutic in the US without infringing on your competitor’s patent. Patent validity also matters: Has the patent expired? If it has, you will not be infringing on the rights of the patent holder. “Patent landscaping” can be performed to determine who owns what in a specific IP domain, see what the competitors are doing, identify potential collaborators and detect infringers. It is highly recommended to perform at least basic patent landscaping from the start! Note that during your search you may come across “A” specifications (A SPEC) and “B” specifications (B SPEC). They look similar but are not to be confused: “A” specifications are patent applications, granted patents are “B” specifications. How to spot IP value and maximise it? It is highly recommended to have strong discussions early on involving all levels of the company management on where the IP lies. There may be a large amount of hidden IP associated your invention/product/technology that is not obvious, but could be highly lucrative. What are the key parts of your invention? Which parts bring the greatest profit margin? Perhaps these are the aspects of your IP that should be protected. For example, the haemodialysis machine of a company has no profit margin. However, the filters and specialist bags, that are essential for the machine and have to be changed regularly, bring in a huge profit. Therefore, the IP associated with the filters and specialist bags are much more valuable, and it is much more important to protect it. In the case of TERM products the most valuable part of the IP may not be the therapeutic product itself, but some part of the process preparing that therapeutic product. Timing your patent is important. As it takes time to turn a TERM product into a clinically used therapy (due to, for example, market authorisation), value of your invention may maximise years after the invention itself was made. As patents have a limited duration, you do not want them to run out before the value of your IP has maximised. It also has to be decided which aspects of the IP are best protected through a patent, and which should be kept as a confidential trade secret and know-how. Is it the inventor? The employer of the inventor? A contractor? A collaborator? Not always straightforward, but very important! A clear paper trail must accompany the IP from the beginning detailing the ownership of the various aspects of the IP. If it has to be determined retrospectively who owns what part of the IP, it will get messy and expensive! Friends can also become enemies when the IP becomes valuable. It may be best to pay them off early and secure the IP. Jointly owned IP sounds like a nice idea but creates problems. You should match the amount you spend on the protection of a certain IP to its benefits. Know your product and how the IP maps onto them, and know your market and your competition. All of these should be recorded in a continuous manner. Maintaining confidentiality is an essential aspect of protecting your IP. Make sure non-disclosure agreements (NDAs) are in place when discussing your IP with external partners/collaborators. Employees should sign agreements regarding the IP and confidentiality. Ensure that your employees understand the limitations of these agreements. Only disclose what is strictly required! Do not disclose unnecessary details, and make sure your employees know to do the same! A small amount of extra disclosed information can lead to springboard patents being filled that build on your IP, but do not infringe upon it. Represents contributions from the TERMIS BPC Committee and our expert researchers. We accredit external contributors where appropriate. Updates and news from the TERMIS Global Business Plan Competition and Pre-Accelerator Programme. Supporting your transition from research to commercial entity.